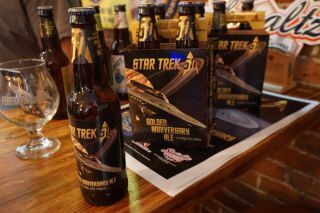 Shmaltz Brewing Co. released a "Golden Anniversary Ale," Voyage to the Northeast Quadrant, in honor of the 50th anniversary of the first "Star Trek" TV broadcast. NEW YORK — In the 24th century, Starfleet served synthehol on its ships and stations; a sad state of affairs for connoisseurs of alcohol. Beer-loving Trekkies in the modern day can take heart, though: a new beer called Voyage to the Northeast Quadrant honors the show's 50th anniversary, and it's definitely the real deal. I had a chance to try Voyage to the Northeast Quadrant for myself at a press event during "Star Trek": Mission New York Sept. 2. The concoction is an unorthodox but agreeable ale, which is arguably the perfect companion for an unorthodox but agreeable show. Since then, Shmaltz has put out two brews to celebrate Star Trek's 50th birthday: The Trouble With Tribbles and Voyage to the Northeast Quadrant. Both beers are considered golden ales, which is appropriate for the show's golden anniversary. I had a small taste of The Trouble With Tribbles, which was a fairly straightforward ale with slightly wheaty and sweet flavors that had already been released. Shmaltz spent most of the event highlighting the Voyage to the Northeast Quadrant beer, which representatives described as a "northeastern pale ale." For a pale ale, I was surprised that Voyage had such a hoppy flavor up front, right after an initial pleasant bitterness. However, the hop flavor subsides rather quickly, to finish with a citrus flavor and a pleasantly sweet aftertaste. It's gentler than an IPA, although not quite as compulsively drinkable as a traditional American pale ale (APA). The tradeoff is that you get a richer, more varied flavor than your run-of-the-mill APA. Voyage to the Northeast Quadrant is a tasty beer; that's the good news. The bad news is that it has an extremely limited run, and there's no straightforward way to find out if it's stocked in your area. Shmaltz recommended checking distributors on its website, then calling them to see where they dropped off the product. It's a roundabout process, and it depends on how patient your local distributors feel. The beer is available now, and costs about $12 for a four-pack. On the other hand, if you miss out on the 50th anniversary ales, Shmaltz is hardly done making futuristic beers. Its next project will be a Klingon-themed strong ale sometime in 2017. 'IwlIj jachjaj!